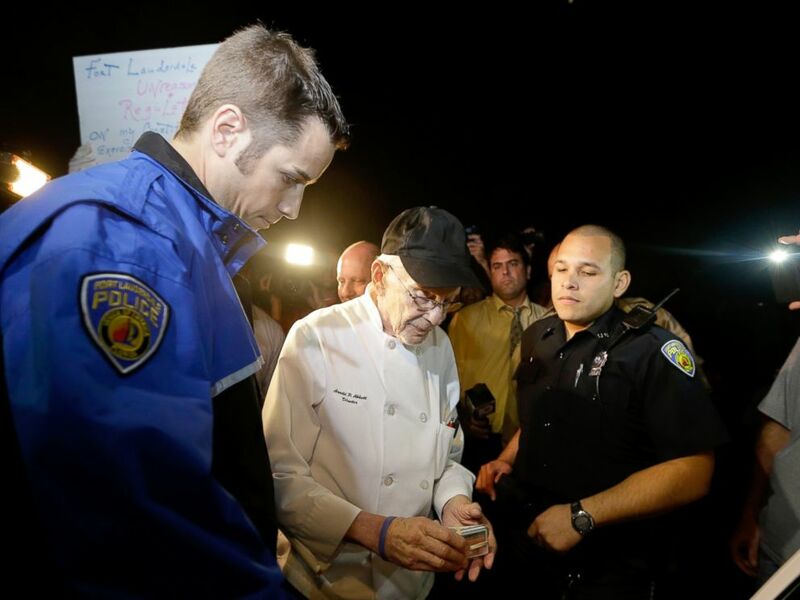 A 90-year-old WW2 veteran has been cited four times for feeding the homeless on public property after an ordinance banning the activity went into effect in Fort Lauderdale on October 31st. The city’s anti-food-sharing ordinance is just the latest local measure of a growing trend of homeless criminalization laws proliferating across the country. A new study by the National Coalition for the Homeless shows an increasing number of cities are passing “quality of life laws,” further isolating an already extremely marginalized community. According to the October 2014 report, 21 US cities have enacted regulations on feeding the homeless since January 2013, with further measures considered in an additional 10 cities. These measures often take three forms: restrictions on public space, enforcement of food safety regulations, or relocation of services. Restrictions on public space typically force food sharing organizations, such as churches, to acquire permits or the city’s permission to operate within a public space, such as a park. In Houston, organizations must obtain the city’s consent to feeding the homeless on public land, or face upwards of a $2,000 fine. In Hayward, California, organizations must obtain a permit and $500 dollars of insurance to feed the homeless, and are only allowed one feeding per month. Other cities have imposed stringent food safety regulations on organizations feeding the homeless. St. Louis, Missouri requires food sharing groups to only serve prepackaged food unless they obtain a permit. In Salt Lake City, organizations must obtain a food handler’s permit to prepare and serve food. Permits to operate in public spaces and food safety requirements are often too high an entry for food-sharing groups like Food Not Bombs, which rely on volunteers and donations to function on their shoe-string budgets. 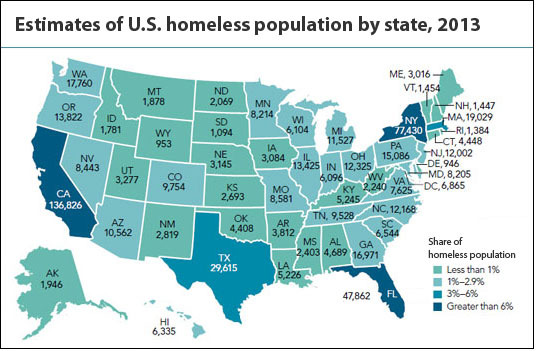 Additionally, increased marginalization of the homeless has occurred through relocation of services. In some cities, residents of particular communities have complained vociferously enough to compel officials or the charity groups themselves to cease or move their operations. In Charlotte, North Carolina, organizations can no longer feed the homeless outside; instead, they must use a building provided by the county. Homeless individuals must also deal with the increasing proliferation of sit-lie laws, which prohibit sitting or lying down in public spaces. A 2014 report by the National Law Center on Homelessness and Poverty found that 53% of cities surveyed have sit-lie ordinances, a 43% increase from 2011. Many of these cities are on the West Coast, including San Francisco, Palo Alto, Seattle, and Santa Cruz. In early October, Monterey joined this Pacific wall of ignominy, enacting a regulation banning “obstructions” from certain city sidewalks. These prohibitions on food-sharing and sit-lie regulations appear to be based on fundamental misunderstandings of poverty and fears of negative economic consequences. Critics of food-sharing often argue that giving to the homeless perpetuates homelessness. Last March, Houston mayor Annise Parker claimed, “making it easier for someone to stay on the streets is not humane,” adding that organizations that feed the homeless merely “keep them [the homeless] on the street longer.” Her statement mirrors other common arguments against welfare and government “hand-outs,” echoing the “pull yourself up by your bootstraps” mentality commonly found in conservative circles. Such statements assume that social safety net programs or services like food, welfare and food stamps make the conditions of poverty and homelessness for otherwise perfectly capable individuals not just bearable, but preferable to employment. Fears of the economic consequences of food sharing and sitting and -lying are also unwarranted. Proponents of such regulations often claim that the presence of homelessness drive customers away from businesses, resulting in weaker local economies. Berkeley mayor Tom Bates, discussing the ultimately rejected sit-lie ordinance Measure S, claimed “People who sit in front of stores are discouraging people from coming in.” But a survey conducted by students from the Boalt School of Law examining this claim found, “no meaningful evidence to support the arguments that Sit-Lie laws increase economic activity or improve services to homeless people.” Similarly, a study by the City Hall Fellows on the efficacy of San Francisco’s sit-lie regulation discovered no deterrent effect, with officers ticketing the same “older homeless population, many of whom suffer from both mental and physical health conditions” and collecting no money from fines. Ultimately, sit-lie laws fail to fix a problem that doesn’t exist in addition to diverting police attention from more serious crimes. This is not to deny that homelessness causes aesthetic problems for businesses and residents. But sequestering the problem to the edges of the city will not make the deeper issues disappear. The failure of the minimum wage to keep up with inflation, decreases in available public health and mental services, cuts to public assistance and cities’ inadequate supplies of housing are problems created by the general public and the state. Such problems are far beyond the capabilities of individual actors, churches, charities, or even single municipalities to address. Housing supply, in particular, has been limited by the obstruction of a wealthy elite: Manhattan today is less population-dense than it was in 1910, while San Francisco residents have rejected multiple attempts to build additional affordable housing. Resolving these issues will require a concerted effort by the full capacity of the federal government with state and local cooperation. Piecemeal legislation, like regulations against food-sharing and sit-lie laws, only further marginalize an already dehumanized population and pass the buck to another residential or commercial zone.